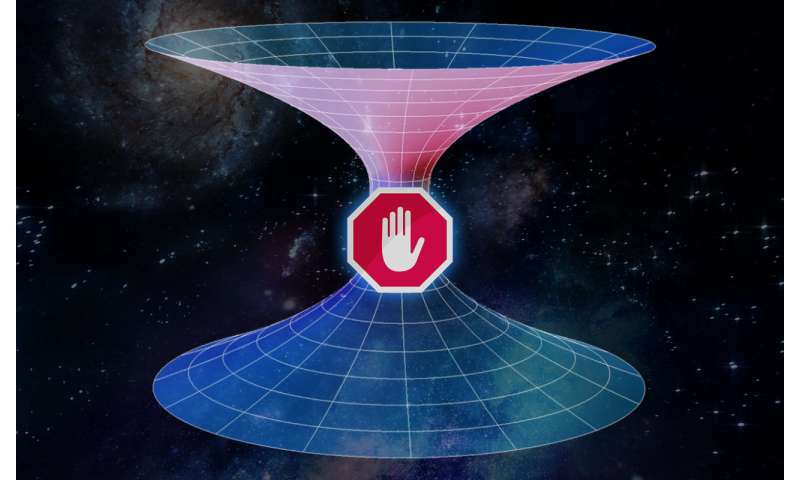 Scientists dismiss the idea of travel through wormholes. There is a new theory about dark energy that involves negative gravity and it supposedly falls right inline with Einstein's mathematics. Maybe that will be the answer. Anything going through a wormhole is spaghettified and incapable of transferring low entropy. Taking into consideration what we think we understand about wormholes? Then adding the speculated possibilities of hypothesized Negative Gravity? @ Really-Skippy. How you are Cher? I'm good and getting better, thanks for asking. Why are mainstream still writing about such fantasies? Maybe that is their job to do. Do you have a job to do? Is it a real job with work to do or is it the fantasy job like the job you have here on the physorg? Obviously, publish-or-perish is still a potent imperative for many mainstream 'hacks'. At least they can find someone to pay attention and pay money for it,,, unlike you who can only donate it for free on the physorg. Are you jealous Cher? Don't you wish your name was known whenever the humans and scientists get together to thinking/discussing physics stuff? Too bad they won't let you in to discuss it with them. Maybe that is their job to do. Well, Ira, CS-gang have been telling us all that the 'job' of science (and the scientific method) is objective SCIENCE WORK and real SCIENCE PUBLISHING (and NOT Science Fiction/Fantasy Writing). You just blew their trolling pretense out of the water, Ira! Thanks. ...scientists get together to thinking/discussing physics stuff? We dont need to travel to the future [or the past]. We just need to SEE it. Can info travel through wormholes? IIRC Professor Leonardo Susskind addresses precisely that in some of his later lectures, maybe on the Holographic Paradigm and / or Information cannot be destroyed. In the next issue from Physical Review, is unicorn crap dark matter? Amusingly, the above nonsense is considered real science to the darky relativists. Time travel would mean computers or other mechanisms could implode algorithmic complexity in physics problems.